In this tutorial in our series on making selections in Photoshop, we'll look at a great way to feather, or soften, selection outlines using Photoshop's Quick Mask mode! Photoshop refers to softening the edges of a selection as "feathering" the selection, and there are plenty of times when we need to feather our selection edges since not everything we need to select has edges that are sharp and clearly defined. We may be trying to select an object that's slightly out of focus in an image, causing its edges to appear soft and blurred, or we may be creating a vignette effect where our selection needs to transition smoothly and gradually into the surrounding background color. Many Photoshop users head straight to the Feather command under the Select menu in the Menu Bar (Select > Modify > Feather) when they need to soften a selection, but the Feather command has a serious drawback in that it gives us no way to preview what we're doing. As we'll learn in this tutorial, there's a much better way to feather selections, one that isn't quite as obvious as the Feather command but is every bit as simple to use and has the added advantage of giving us a live preview of the result! The Layers panel showing the photo sitting above a white-filled background. An elliptical selection outline has been drawn around the couple in the center of the photo. Going to Select > Modify > Feather. The Feather Selection dialog box makes feathering the selection edges a guessing game. The selection outline doesn't look much different than it did before. In truth, the selection edges are now softer, but Photoshop's standard "marching ants" selection outline has no way of indicating that the edge is feathered. It still looks like a solid, hard edge. The reason is that the standard selection outline only appears around pixels that are at least 50% selected. It does not appear around pixels that are less than 50% selected. So basically, Photoshop is looking at us right now and saying "The most I can tell you is that any pixels inside the selection outline are at least 50% selected, and anything outside the selection outline is less than 50% selected. I wish I could be of more help." Photoshop shouldn't feel too bad, though, because it actually can be of more help. In fact, it can give us a full preview of what our feathered edges look like. It just can't do it using the Feather command and the standard selection outline. What we need, then, is another way - a better way - to feather selection edges, and that way is with Photoshop's Quick Mask mode. Clicking the Quick Mask icon at the bottom of the Tools panel. In Quick Mask mode, the red overlay indicates areas that are not selected. Photoshop's Quick Mask mode doesn't just give us a different way to view selections. It also lets us edit selections in ways that are not possible with the standard selection outline. For example, we can run any of Photoshop's filters on the overlay! At the moment, the transition between the area covered by the overlay and the area not covered by the overlay is very sharp and abrupt, which means my selection still has hard edges. To soften them, I can simply blur them using the Gaussian Blur filter. 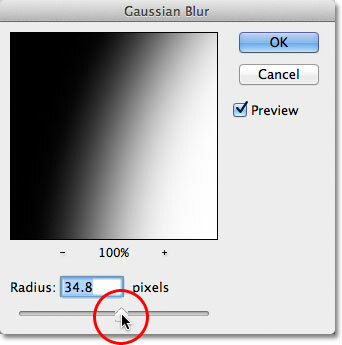 Blur the overlay edges by dragging the Radius slider towards the right. Softer overlay edges mean softer selection edges. Click again on the Quick Mask icon to switch back to normal mode. And there we have it! That's how to feather a selection in Photoshop, complete with a live preview of the results, using Quick Mask mode and the Gaussian Blur filter! To learn more about Photoshop's selection tools, see our How to make selections in Photoshop series. Or visit our Photoshop Basics section fore more Photoshop topics!